West Pier, Dun Laoghaire - 7th January 2018. South Dublin members at the base of the West Pier, Dun Laoghaire. Picture by Gustavo Zoladz. Having got the trivial matters of Christmas and New Year out of the way, it was time to get the show back on the road again with our first outing of 2018! Keeping it local, we headed to the West Pier, Dun Laoghaire where about 30 South Dublin members were in attendance. Conditions were distinctly wintry with a stiff cold easterly breeze, but on the other hand it was dry throughout with excellent visibility and partly cloudy skies. 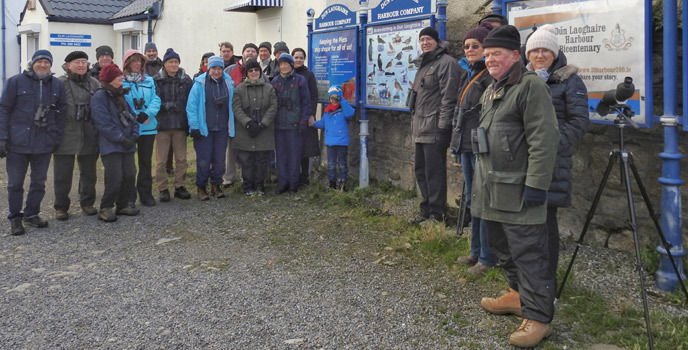 We met in the 'Windsurfer's' car park at 10:30, were we were greeted by Branch Chairman Frank Doyle, who then handed over to Niall Hatch who led us. 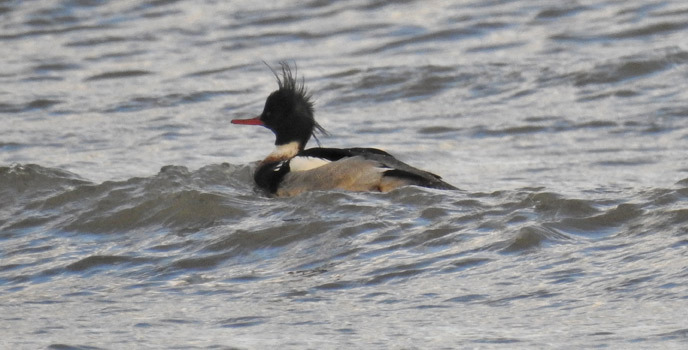 This punk-rock Merganser was only seen by a few who arrived early. Picture by Gustavo Zoladz. Taking our time, we proceeded to the end of the pier and back, stopping regularly to scan in both directions over Dublin Bay and Dun Laoghaire Harbour. Wildfowl were not much in evidence, indeed the only duck seen was a single Red-breasted Merganser, and only by a few who arrived early. 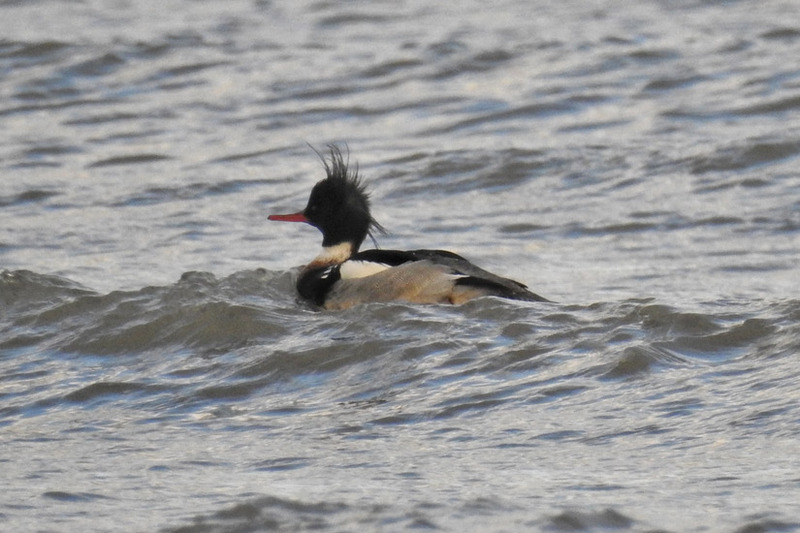 Mergansers are Sawbills, a group of five species of fish eating ducks that have serrated edges to their bills to help them catch and hold fish. The other sawbill on the Irish List is Goosander, which generally prefers riverine habitats year-round. Early on, some brief views of a Great Northern Diver were had just off Trader's Wharf, but it didn't hang around and was not seen subsequently. 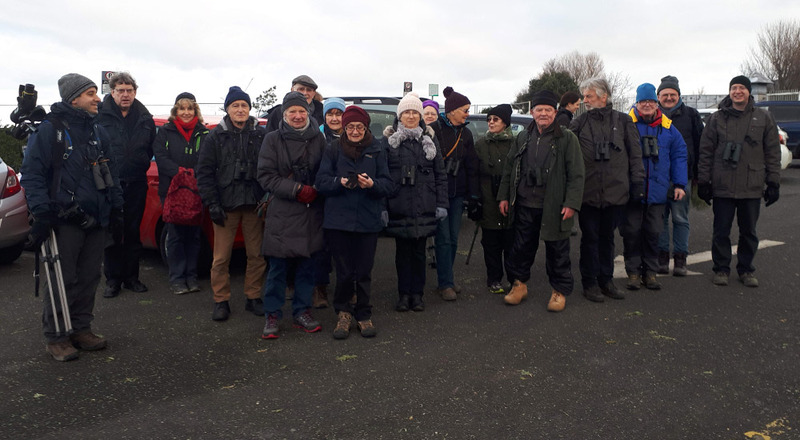 Some very distant Great Crested Grebes were noticed on Dublin Bay and we saw the Little Grebe that regularly frequents the Coal Harbour, but no sign of the Red-necked Grebe that has wintered in Dun Laoghaire for the past few years. 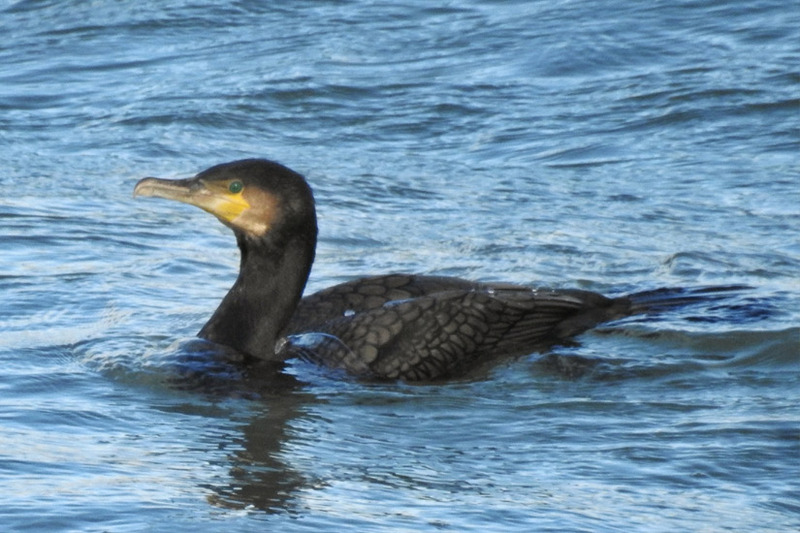 In contrast, Cormorants and Shags were ever present, both in the harbour and out on the bay. A lone Grey Heron was perched on a pontoon in the Coal Harbour and we later saw it flying off towards the East Pier. 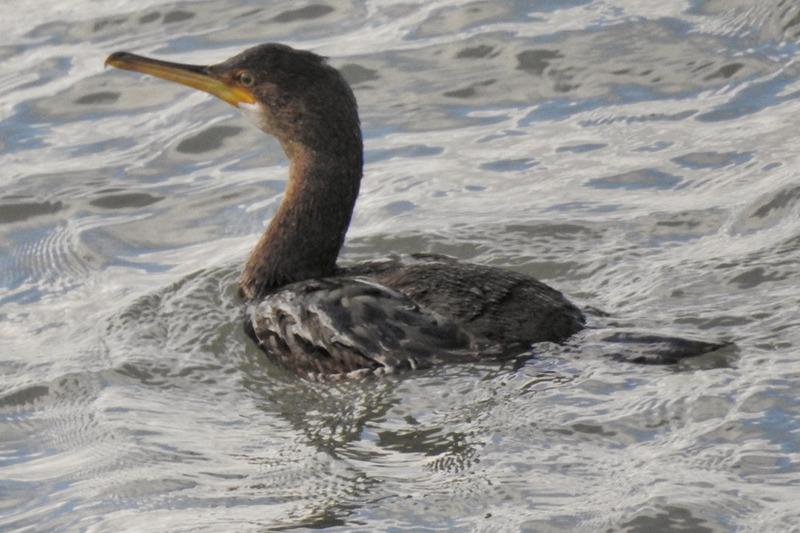 One of many Shags that we saw. Picture by Gustavo Zoladz. On the small beach adjacent to the Windsurfer's car park there were Redshank, Oystercatcher and Turnstone, all of which we saw intermittently in various numbers at various places along the way, both in flight and on the deck. 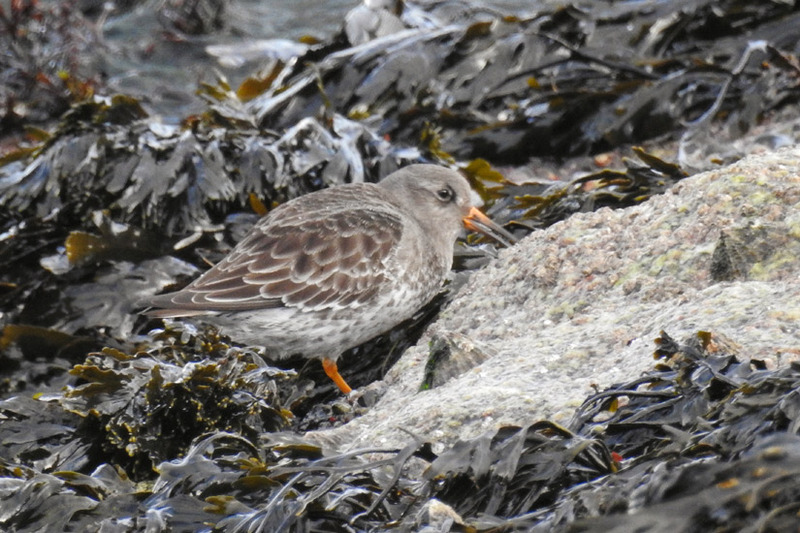 But we had to hike it all the way to the tip for Purple Sandpiper and we were rewarded with at least four. You always have a good chance of seeing these winter visitors anywhere there are rocks covered with plenty of seaweed. Gulls were everywhere, with Great Black-backed, Herring and Black-headed of all ages the most numerous. We also saw at least three Mediterranean Gulls (comprising two stunning adults and a third-winter), a single Common Gull right at the tip by the light-tower that was probably a second-winter bird and a single Kittiwake that was flying around the fish shop end of Trader's Wharf. The only auk encountered was Black Guillemot, and we saw both winter and summer plumaged individuals. 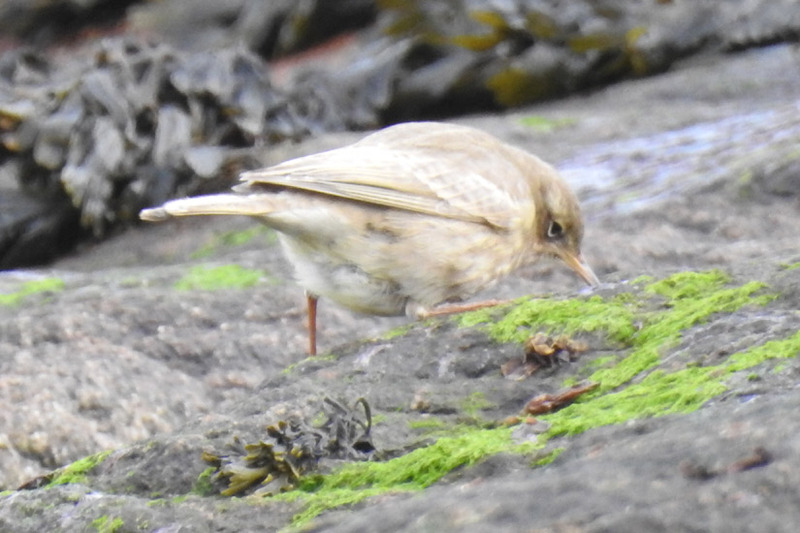 A rather unusual looking Rock Pipit at the tip of the East Pier. Picture by Gustavo Zoladz. Passerines were few and far between, and consisted mainly of corvids. 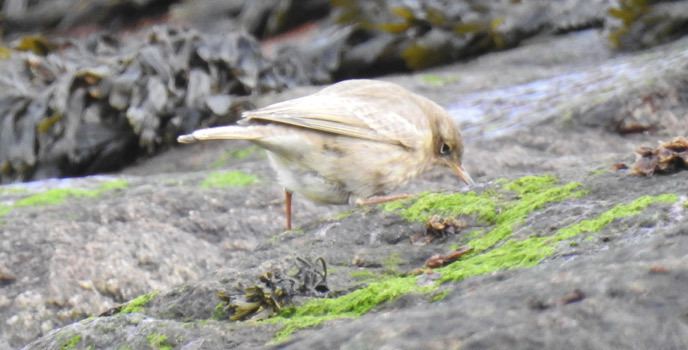 However at the very tip of the pier and down among the seaweed with the Turnstones and Purple Sandpipers was a very unusual looking Rock Pipit. It appeared to be very washed out, lacking its normal pigment; probably an example of a condition known as leucism. We subsequently heard reports that it had been present the previous winter also, so in every way it seems to be doing fine. 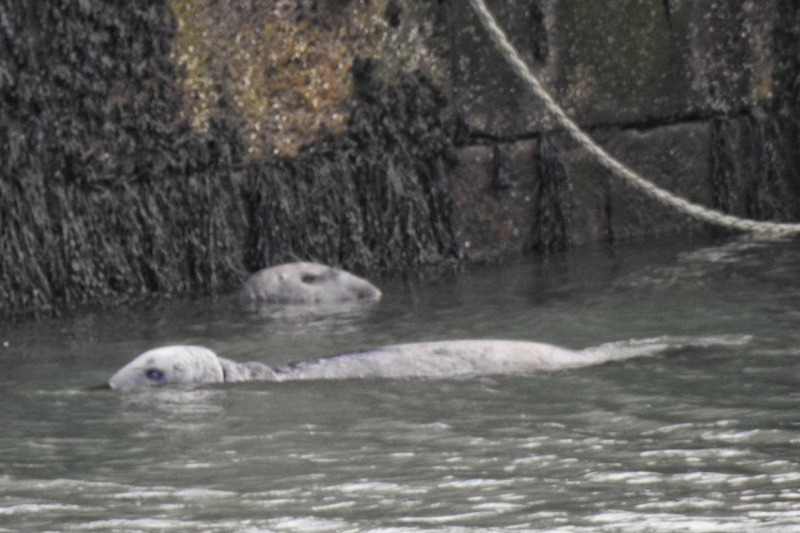 Sorry to say there were no Snow Buntings this time out, Howth appears to have nabbed them all, but we did manage to see a couple of Grey Seals in the inner harbour. 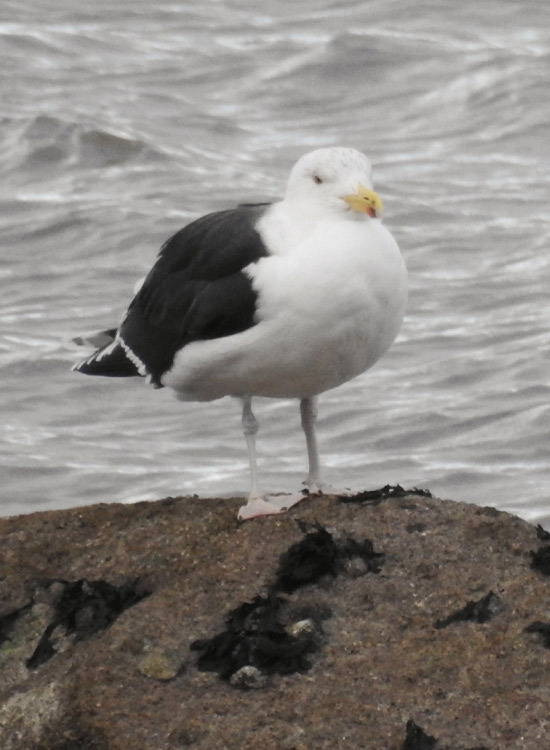 Don't mess with a Great Black-backed Gull! Picture by Gustavo Zoladz. Some more pictures taken on the day by Gustavo Zoladz and Joe Hobbs. 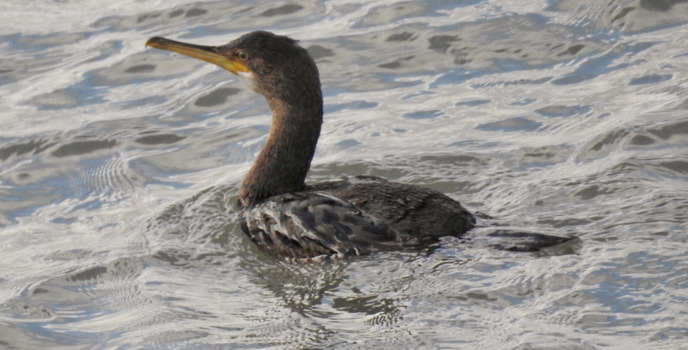 Cormorant at swim in the harbour. Picture by Gustavo Zoladz. 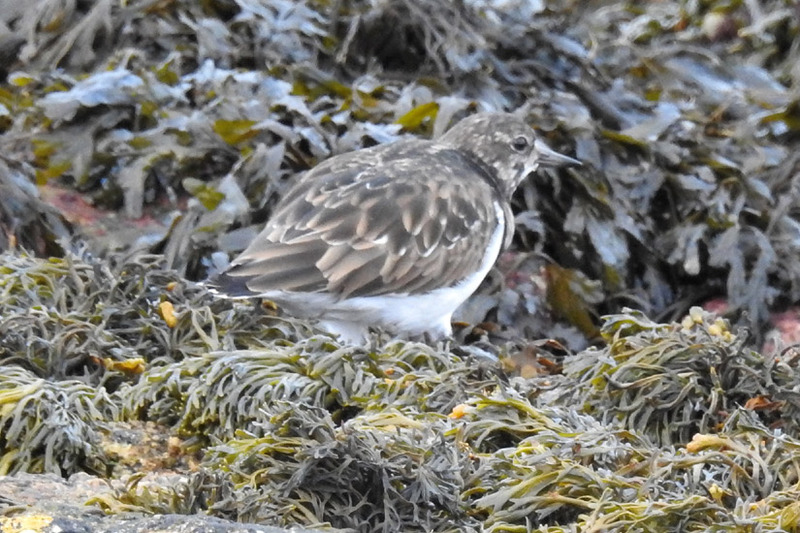 Turnstone looking for stones to turn. Picture by Gustavo Zoladz. Purple Sandpiper at the tip of the West Pier. Picture by Gustavo Zoladz. 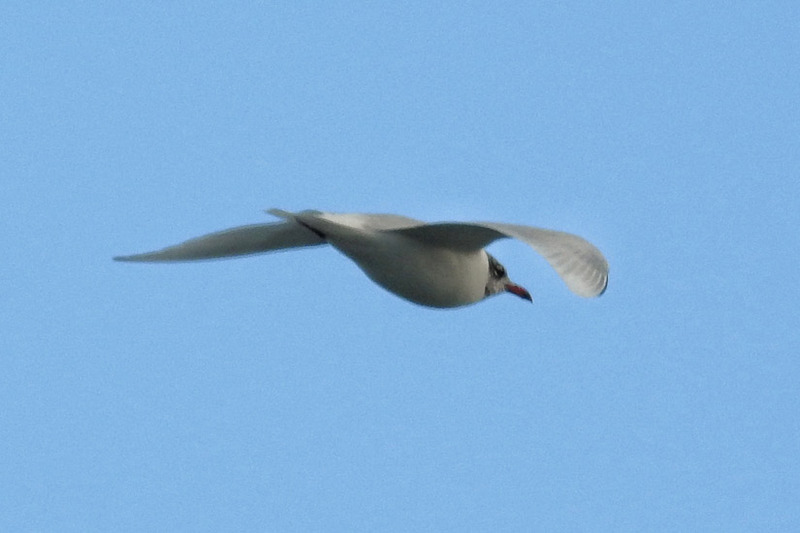 Fly-by Mediterranean Gull. Picture by Gustavo Zoladz. 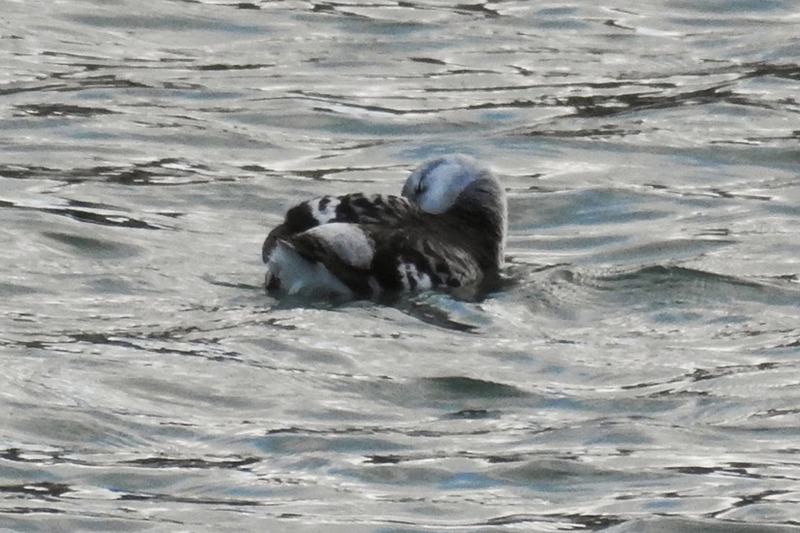 Winter plumaged Black Guillemot. Picture by Gustavo Zoladz. A couple of Grey Seals checking us out. Picture by Gustavo Zoladz. South Dublin members well wrapped up and ready to go. Picture by Joe Hobbs. 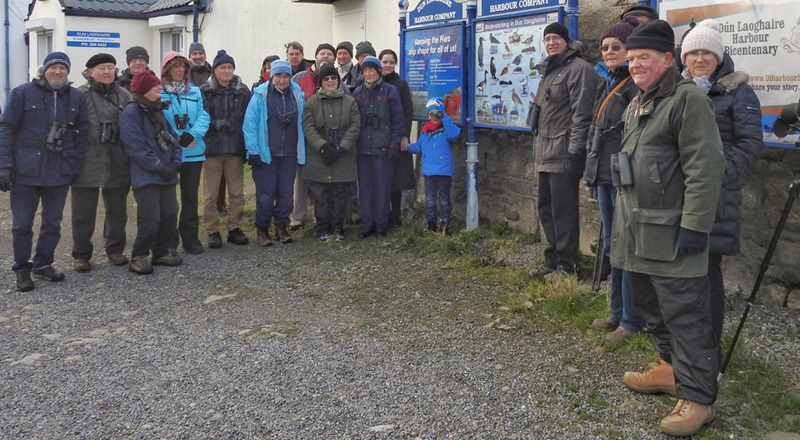 We got back to the car park with lunchtime approaching so we called it a day, satisfied that we got 2018 off to a great start, having seen some wonderful birds and a couple of Grey Seals.